Fall Fun | Can I Bring the Dog? Fall seems to be a good time for Chico to find stinky, gooey stuff to roll in. Last weekend, he came back from somewhere spotted from head to tail with a black, gooey, SMEEE-eee-ELY substance spotted all over him from head to tail. So he got a bath under the cold hose. At sunset. Neither of us liked that very much. 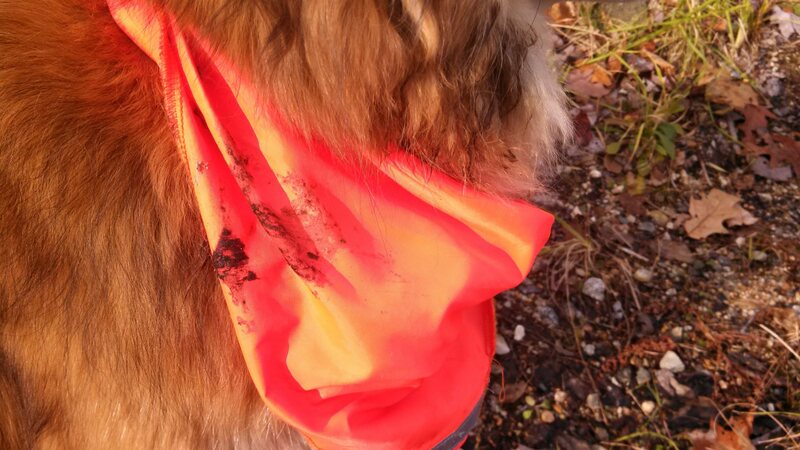 The next day, he came back from somewhere, with smelly, sticky, black gook all over his ruff. So he got rinsed off under the cold hose. The next day, he came back from somewhere with black, sticky, smelly something all over his neck, shoulder, and ruff. I assure you, dear reader, it smelled terrible. So I rinsed him off under the cold hose again, and stopped walking him in that direction. I’m slow, but I learn. This entry was posted in Uncategorized and tagged smelly stuff and dogs. Bookmark the permalink.